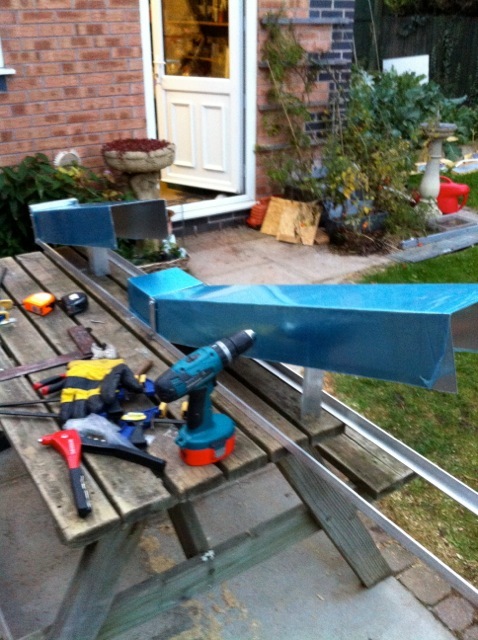 13 Oct 2012: My wife thinks I should concentrate on the extension only, but I am aware that I need to work on the exterior too in case my scaffolder wants his boards and poles back! 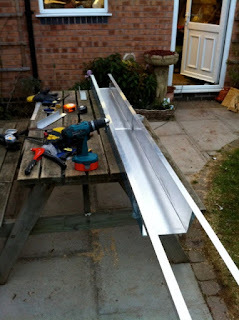 I've been using the aluminium sheet offcuts from the roofing work to make the vertical duct. The duct has to provide access to the pipes (well I hope it will not be needed, but I have to imagine myself up a ladder at some future date) and it has to be waterproof too. 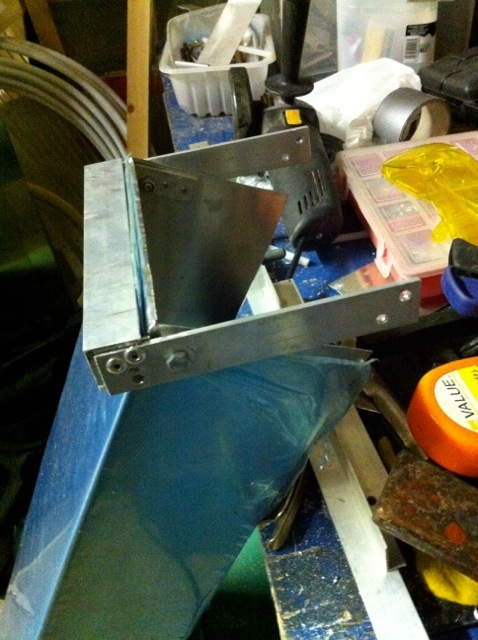 Each part of the duct opens with a top hinge, like a motorcycle helmet. Although I am an architect and it should be drawn first, I get a different drawing every time. I find the best way is just to start making it, looking at the offcuts that are available to me. I usually finish up with an economical and functional result. Here, the duct is lying face down. It's in three parts now, and will be in four when it is complete. It has to be close to the Sunbox, so not all of it can lift out because there is presently a PhotoCell in the side panel that I cannot move. The duct still has its protective blue plastic packaging. This makes me wonder what it was like for the early motorcar builders (of the 19th century). 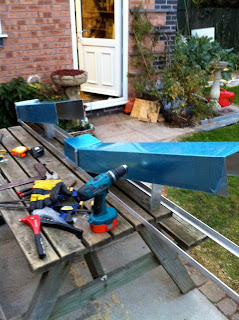 Here I am only making a bit of body work, but there is still much labour required. I try to imagine the labour of having to custom build all the parts of an engine (before the process was industrialised).